Little Feet, Big Step Christmas Empowerment Project 2017. -We give out food items . -We donate to Charity homes, orphanages, hospitals and visit prison. Like you did before , you can send us clothing, books, toys, various food items, money and anything you want to send to the needy, will be received and delivered on your behalf. 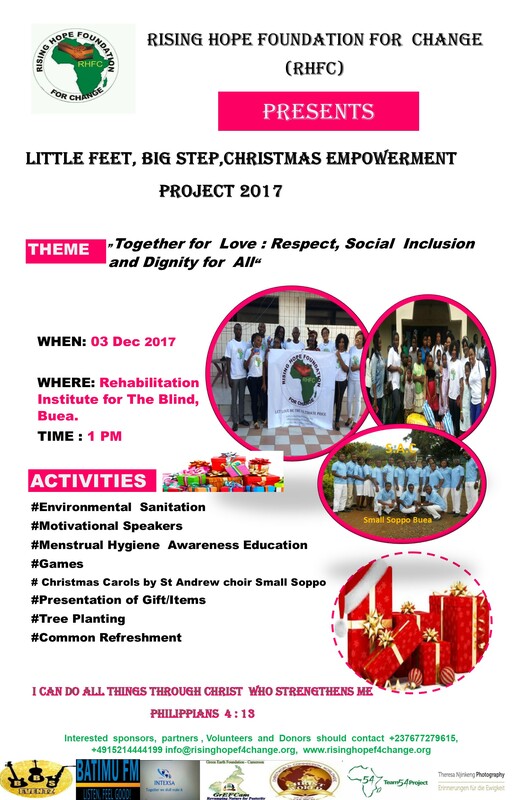 You can as well join us on the 3 December 2017 at the Rehabilitation Institute for The Blind, Buea, Cameroon. We remain incredibly grateful to all our supporters, volunteers throughout the world, country and region who organize collections or simply add an extra item to their own shopping list in the run to Christmas. We urge companies and businesses to make donations of goods and help raise funds to help us meet the ever increasing numbers of our brothers and sisters in need. Contact TEAM RHFC at Info@risinghopef4change.org.